It is a little difficult, but not impossible, to sell a house without an agent. The benefits, however, are many. For one, you don’t have to share profits on the home sale. 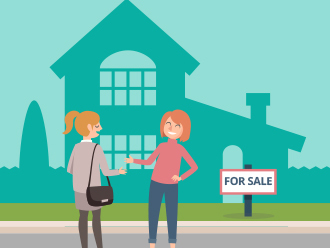 Additionally learning to sell without a realtor can be an eye-opening experience—from understanding paperwork to mastering negotiation skills, there’s a lot to learn. We have listed a few options available for people who are not eager to hire a real estate agent. Thanks to the internet, which is now more prevalent than ever, there’s nothing you can’t sell online. Websites like Trulia, Zillow, and RedFin generate millions in traffic, with Zillow alone receiving more than 533 million visitors last year. A 2017 report by the National Association of Realtors found that nearly 97% of buyers look online when buying a home. You can either hire an online agent to list and sell the home or you can do it yourself. Additionally you could either opt for a paid listing or choose free FSBO sites. Promoting the listing on social media also helps. While selling online helps save thousands of dollars in agent commissions, it isn’t exactly free. You will have to spend a few hundred dollars to make your listing stand out so it can gain maximum exposure. Thanks to homeowners pursuing unconventional ideas in order to sell a house, auction sales aren’t that taboo anymore. Selling through auction can be very effective in a seller’s market because auctions fuel competition while playing to an emotional audience. But auctioning is not only effective in a competitive market—in a market that is less than enthusiastic, auctions can help homeowners understand their property’s true value. And since most homes sell as is, sellers don’t have to pay for additional repairs. However, you will have to pay the auctioneer for marketing and paperwork costs. Fast homebuyers like us buy homes for cash. Our USP is our ability to deliver a stress-free sale experience. From the initial meeting to closing, the entire process can be completed in a week. You don’t have to pay anything for closing or other formalities. You can sell the house as is, without repairs or renovations. Homeowners do not have to get rid of the junk and unwanted household stuff either—we’ll do all the junk hauling. We’re property investors which means our quotes aren’t affected by market conditions. We will pay the best possible price for your house. Are you looking for help selling a house without an agent? Contact us!